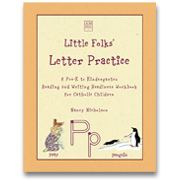 This workbook introduces letter formation and beginning phonics while simultaneously exposing children to tenets of our Catholic Faith. The perfect preparation for Level 1 of Little Stories for Little Folks. 66 pages. 8½"x11"